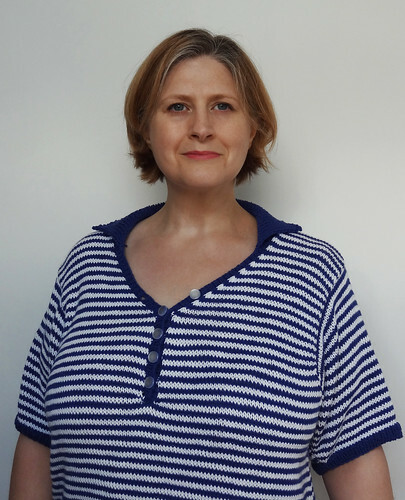 I managed to get my King Cole Striped T-Shirt finished before the end of the Summer! I actually finished it soon after my last post about it, but I didn't have an opportunity to take photos until recently. And, as you know, I don't like to post without pictures! As you can see, it is rather a generous size and there really is no shaping at all, which is not the most flattering of style on me. However, it is amazingly comfortable. The yarn is soft and light and I would use King Cole Bamboo Cotton again without hesitation, especially as it had nice colours. It is a gorgeous and luckily I have loads of the yarn sent to me left over. I don't know how it happened, but I have 2.5 skeins of each colour lef. I got sent the recommended yarn and I got the recommended gauge and the garment is the size specified in the schematics. They are obviously generous in their yarn estimates at King Cole. It was quite nice knitting a garment in pieces again. I haven't done that in a while and it does seem to go more quickly. I know that was because I was knitting a t-shirt, but psychologically it does feel quicker because it is broken down into pieces. 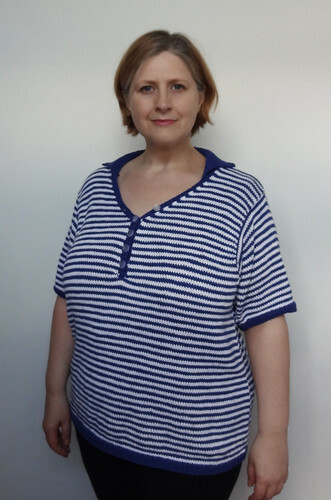 With this garment I made my usual mistake of using the size for my full bust, rather than making the size specified by my upper bust measurements and adding in short rows. I thought I would get away with it because of it being a boxy shape, which to a certain extent I did, but when you look at the back you can see that it is far too wide. 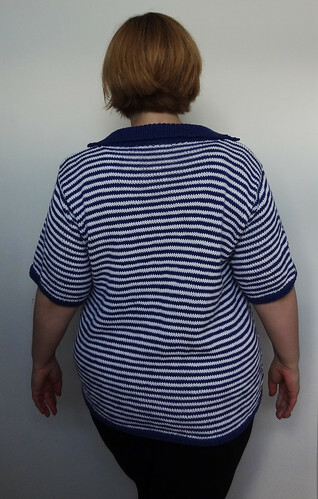 I was put off from doing short rows because of the stripes, but what I forgot was I could have gone down a size for the back and knit the larger size for the front and done a bit of jiggery with the arm holes and sleeves. I really love the placket and collar on this tee. It's the first time I've done a placket and I love the look of it. It's a flattering style for me, as it breaks up the expanse of my bust! The collar is ribbed so it lays really nicely across the back of the neck. The button band itself was easy enough to do, apart from the little tiny piece of sewing to anchor the two sides on top of each other and into the garment at the bottom of the placket. I messed up the sewing and it was a nightmare to unpick it and try again. It still pulls a bit, as you can see, but it's not as bad as the first attempt. It's tricky to sew it in neatly in such a small space and such thick layers. If anyone has any tips, I'd love to hear them, for future reference. The buttons I got from Minerva Crafts to finish off the project were these. I really like this style of neutral button and have used the same style on various children's projects because they are nice and smooth. I think they were the right style to use for this garment too, as they fit in with the unfussy look of the t-shirt. Overall, even though the t-shirt is too big, I really like it. It won't stop me wearing it, even though it's not the most flattering of styles for me. It feels too nice to stuff in the back of the drawer, and it will look good with jeans or leggings. It will be perfect to wear when it stops being so lovely outside, just before it gets too cold! We have had such a lovely long Summer this year that it's still been too hot to wear a t-shirt with sleeves for any length of time! I have raved before about how lovely the yarn is, so I won't go into that again, but the pattern itself was clearly written and I didn't have any problems following the directions. I'd like to say thanks to Minerva Crafts for sending me the pattern, yarn and buttons to review. They kindly didn't put any time constraints on me to get the pattern finished and they didn't put any pressure on me at all to give them (or their products) a favourable review. A sick blogger couldn't ask for anything more! If you are in the UK, go and check out their range, they are not just a yarn store, but supply materials for lots of other crafts, so you may find something you like!